All you need to know about getting around at the 2019 Perth SuperNight! Click here for full resolution copy to download. Patrons in possession of a 2019 Supercars Membership card will be entitled to enter the track 30 minutes prior to the general public, via Gate 21 only. Avoid the traffic and take Transperth to this year’s PIRTEK Perth SuperNight. Public transport is included in your event ticket and shuttle buses will be operating from Clarkson Station on Friday and Saturday. For more information and to plan your journey visit the Transperth website HERE. 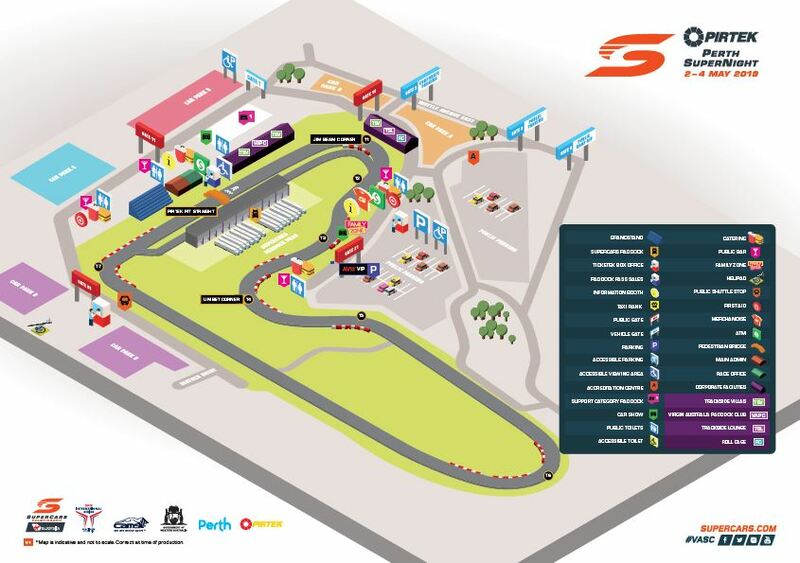 General Admission Parking is available free of charge at Barbagallo Raceway (subject to capacity). Use gate 3 to access the General Admission Carpark. Hire your car from AVIS while in Western Australia, and you'll be in Pole Position with VIP parking at the PIRTEK Perth SuperNight. The AVIS VIP Car Park is located outside Gate 21. The drop-off/pick-up area for passengers arriving via taxi or Uber is located outside of Gate 4. 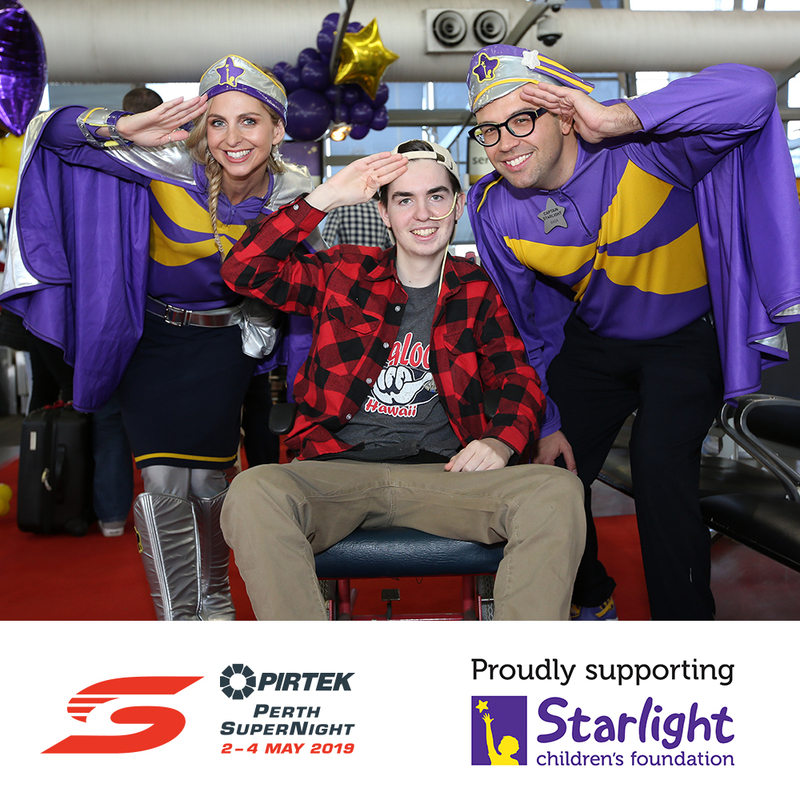 Starlight Children’s Foundation brightens the lives of seriously ill children, young people and their families. With over 560,000 experiences created each year, Starlight succeeds in helping sick kids forget about their illnesses and restore the fun and happiness of childhood. Starlight uses thorough and ongoing research from Australian health professionals to develop programs designed to distract and positively disrupt the lives of children in hospitals. This is based on positive psychology principles, which support the ‘total care’ of children and young people. Find out more about Starlight Children's Foundation HERE. There will be several ATM's located around the circuit. Refer to the Track Map for locations. The official event program will be available for purchase for $10 from the Ticketek box offices or the official program store. There will be several first aid facilities located around the circuit. Refer to the Track Map for locations. There are a number of food outlets to choose from located around the event precinct. Patrons may bring in limited quantities of food and drink for personal consumption. Alcoholic beverages are available for sale from the numerous bars and licensed outlets located throughout the venue. Bars will operate from gate opening times. Liquor licensing laws prevent patrons from bringing their own alcohol into the venue. No glass is permitted. The is one Information Booth at this event which is located in Merchandise Alley . The Information Booth will be the first point of contact for all lost property. There are baby changing facilities located in the Paddock Toilet block. Tune into 87.8FM during the event to hear on track commentary of racing action and what's happening on and off the track.